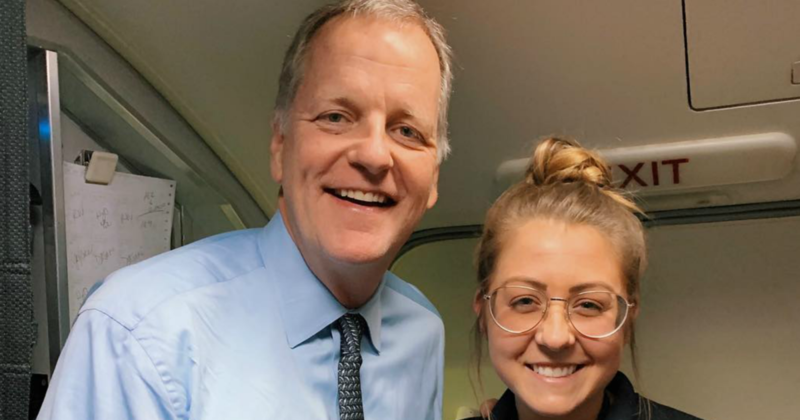 An American Airlines flight attendant dropped a tray of drinks on the airline's CEO – and she documented the incident on Instagram, writing, "I WAS MISSED." Maddie Peters said "not once" in her four years with the airline had played a drink on a passenger. But that changed when, according to her account posted online, she was recently serving drinks in first class. A passenger bumped into her tray "and the drinks go flying." "I wanted to drop dead right there in the aisle," she posted. "(Like I still employed ?!) I'm still slightly traumatized / embarrassed." The incident happened on a recent flight from Phoenix to Dallas. The CEO, Doug Parker, had introduced himself to the flight's crew members when he boarded the aircraft, The Associated Press. Peter said, though, that "luckily" Parker was "a good sport." She also said he was "super cool." "He later came back and we chatted for a little, and joked about the rest of the flight," she said. "When he was getting off the plane he told me he'd never forget me … that's a good thing right? " " Accidents happen, "she added.